Visit J&R, online at JR.com, for the best in electronics, computers and more, directly to you, from a company you can trust. J&R has been providing customers with a combination of price, selection, security, and service for over 30 years. J&R not only sells an incredible array of CDs and a vast selection of top computer goods, but also digital cameras, cell phones, TVs, stereos, MP3 players, DVDs, kitchen appliances and much more. Save on your next purchase at JR.com with J & R discounts, J & R coupons and J & R savings from 58Coupons.com. 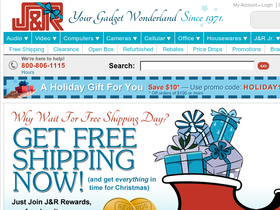 Save $10 on all orders over $100 from J & R when you use this code at checkout. Click link to get started. Check out JR.com and you'll get free shipping on over 15,000 items. See site for details. JR.com is now offering up to 60% off digital cameras. Click link to shop. Act now and take a look at the clearance section on JR.com where you can find savings up to 33% on top Electronics. Click link now. Right now JR.com is offering DVDs from only $5.99. Click link to shop at J&R today.